Windows Media Player is one cool way to play audio and video files on the computer. It comes bundled with Windows operating system. Windows Vista has Windows Media Player 11 installed by default. Windows Media Player 12 should come bundled with upcoming Microsoft operating system ‘Windows 7’. 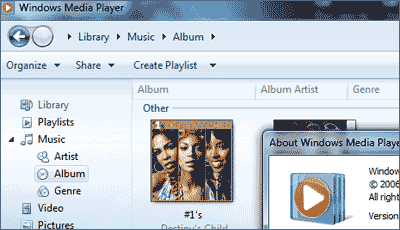 However, you can test drive and use Windows Media Player12 on your Vista computer (not XP). Misaki2009 @ devianart has ported Windows Media Player 12 of Windows7 for Windows Vista. After you download, you need to copy one file and one folder and its all done. Just copy above file / folder and you are all set to use Windows Media Player12 on Vista. Please note: this is not anÂ official release, make sure you create a restore point before trying this out – use discretion. Alternatively, you can install Windows Media Player12 theme on Media Player11 in Vista. Thank you, I have recently been searching for info about this topic for ages and yours is the best I have located so far. Your site is tat. Nothing works. it does work.had to use a reg entry called file protection and res hack.took me a good few hours.but it does work. Tell us how u did it. Windows 7 is a x64 build so if you’re running 32 bit Vista, like me, it won’t work! worthless i’ll try it bt it doesn’t wrk..